According to a Swedish research group that examined the correlation of food supply and fresh water resources, in future we cannot afford ourselves to consume as much meat as we do nowadays. In the oncoming forty years we have to give up the habit of eating animal-based produce, because water needs of livestock-farming is multiple times more than that of agriculture and we will need every drop of water in order to grow the minimum supply of vegetables and grains for world’s population. “There will not be enough water available on current croplands to produce food for the expected 9 billion population in 2050 if we follow current trends and changes towards diets common in western nations,” the report of the Stockholm International Water Institute (SIWI) states. Humans derive about 20% of their protein needs from animal-based products now, but this may need to be decreased to just 5% in order generic cialis that food industry can keep pace and be able to feed the growing population of the globe. At present one third of all available agricultural land is used to produce fodder crops for livestock. In comparison, a diet of a meat-eater consequently needs approximately 5 to 10 times more water, than that of a vegetarian. “Nine hundred million people already go hungry and 2 billion people are malnourished in spite of the fact that per capita food production continues to increase,” the report said. 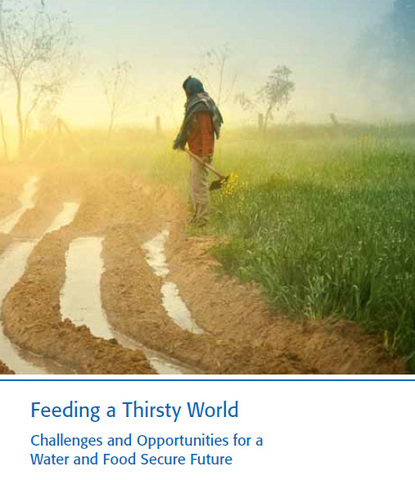 “With 70% of all available water being in agriculture, growing more food to feed an additional 2 billion people by 2050 will place greater pressure on available water and land,” declares the report.